To this day, Shawna still continues to save this event as one of her favorites. The fact that we worked with Details Details, John & Joseph Photography, and Amber lighting is a testament to how strong our relationship is! We love this throwback to when the company was first started and know that you will too. We went with all white everything with the occasional pops of the robust purple. The Segerstrom Center for the Arts in Costa Mesa provided us the blank slate we wanted to work with. White chiavari chairs matched perfectly with the clean and modern design. 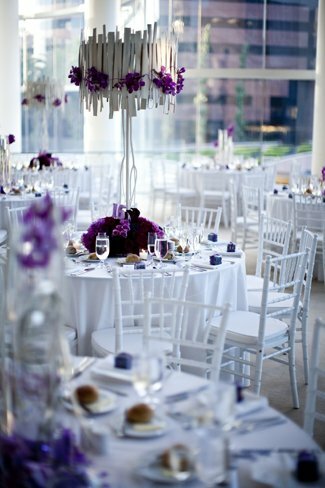 Tall tables featured the lampshade design while the shorter tables showcased an intermingled mix of branches and clear glass cylinders with submerged florals. 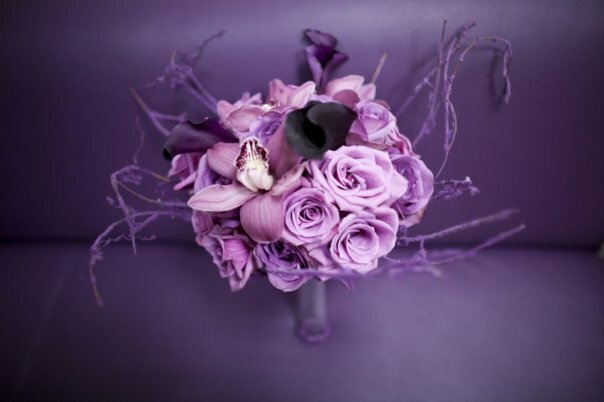 Made up of lily grass, balsa wood, and beautiful purple panda orchid blooms, the bouquet was so artistic and daring that we wish we could make more like it! 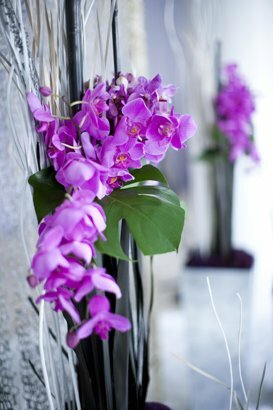 Shawna came across a magazine and was inspired to make this lampshade out of balsa wood chips and more deep purple orchid blooms. This design is still super common for Shawna to use, and you can see it in many of our more recent blog posts using glass rods. The ceremony featured a vibrant white fur aisle and was lined with white branches standing over 6ft tall. More white chiavari chairs were used in the open room with tall ceilings as guests waited for the couple to say their vows in front of a freestanding drape design. As designers, we are so appreciative to have amazing photographers who capture these events and make it so easy to come back and relive where we once were and see truly how far we've come! Much love to John & Joseph Photography for capturing one of our favorite moments of the past! Venue: Segerstrom Center for the Arts in Costa Mesa, CA.